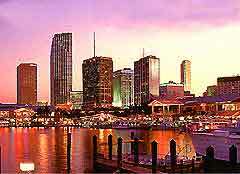 Miami is a seductive city, attracting large numbers of tourist each year. With more than 15 miles / 24 km of beaches, much of Miami's appeal is gained from its enviable coastal setting. Other highlights in Miami include its acclaimed Art Deco buildings, exceptional nightlife and top tourist attractions, including the Miami Seaquarium, the Miami Everglades National Park and the Freedom Tower.